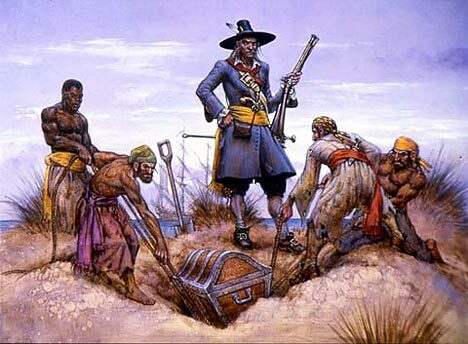 Captain Kidd's treasures found !? It seems by by the following account, that all the gold in the world is not packed away in the placers of the Sacramento. The other day, Martin and Samuel Shaw, of Palmer, while on a hunting excursion, near the "Old Boston Road", on "Snake Hill", discovered a cave in the rocks. In the den they found a sealed bottle containing a letter, purporting to have been written by Captain Kidd, the notorious pirate, to some of his inferior officers, informing them where some large deposits of wealth were made, and entreating them to possess themselves of that treasure, and extricate him from some difficulty which the letter represents him to have been in. He adds that he sends the letter by a footman, as other conveyances were unsafe. The letter bears marks of great antiquity, and some of the shrewdest men in the vicinity, after examining the document and the circumstances of the case, have joined with the discoverers, to go in pursuit of the buried treasure. Our informant, who is perfectly reliable, informs us that the letter would be submitted for publication, were it not for the fact the the place of deposit would be thus revealed, and the aims of the lucky finders be thwarted. That would be bad truly. Found or not found finally...?